Hainanese Chicken Rice is created by Chinese from the Hainan province who migrated to Malaya in the mid 19th century. Hainanese people were often hired as cooks in British military camps and homes of the wealthy. The most loved Hainanese food is their Chicken Rice. This dish is a popular lunch menu for working Malaysians who want a filling and delicious meal. What makes ‘Hainanese’ chicken rice different from ordinary is the juicy skin. The chicken is poached in chicken soup and then bathed in ice to create a succulent skin. Yes, we will dip a whole chicken into the pot and then transfer into an ice bucket! This meal is only complete with aromatic ’yau fan’ cooked with pandan leaves and other secret ingredients; chili sauce; ginger condiment; chicken soup; and seasoned soya sauce. Though this meal takes a lot of work, but it is worth it! You will learn techniques to create succulent skin and chopping the whole chicken. Afternoon Class at 2 pm is available with minimum of 3 people. PICK-UP: We also offer pick-up from and back to your hotel at an additional price of USD 25. I’m Sara Khong, a professional cook and author of four cookbooks: Malaysian Meals In 30 Minutes, One Pot Wonders, 3 Ingredient Recipes, and Slow Cooker Recipes. 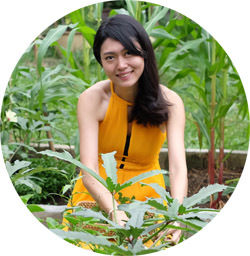 I'm passionate about making authentic Malaysian cuisine and growing herbs and spices in my edible garden. I look forward to share with you Malaysia's most popular dishes made in my family's kitchen!